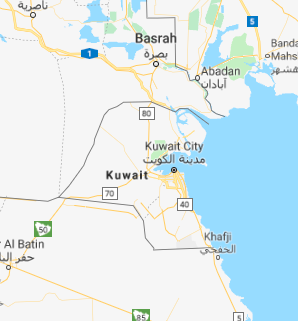 “Kuwait.” Map. Google Maps. Google, 31 Oct. 2018. Web. 31 Oct. 2018.
between Iraq and Saudi Arabia. The name Kuwait is derived from “kut,” an Arabic word for fort. Kuwait is the home to more than a hundred different nationalities which is why a traveler will notice a great variety of clothing. Traditional Kuwaiti costumes introduce a style that has changed little for the past fourteen centuries and many Kuwaiti women and men wear these cultural clothes. The traditional Kuwaiti woman’s dress is a long-sleeved, loose, floor length dress or daraa’. On a daily basis many women wear the abaya, which is a popular head-to-toe black silk cloak that a woman can put on over her dress. During special occasions and festivities, the dress may be covered with a sheer, sequined and/or embroidered dress which is called a thobe. During Ramadan it is common to see young girls wearing their dara’as and young boys wearing their dishdashas, which are white dresses that are similar to a woman’s dress. Women of Bedouin origin regularly wear a burqa, a short black veil that leaves the eyes and forehead exposed or a bushiya, which is a semi-transparent veil that covers the entire face. The embroidery of the cultural dresses is done with handmade zari, which is silk thread covered in hold or zari hurr, thread covered in silver. Colored silk thread, brisim, may also be used to add contrast to the zari. Cultural Kuwaiti clothing is based on the principle of modesty, for both men and women. 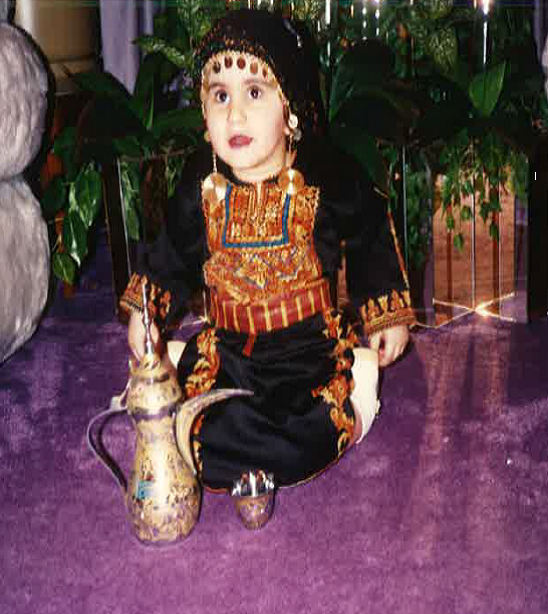 Hanaa, a first generation Palestinian woman, spoke about the connection cultural clothing gives her to her identity. She immigrated from Kuwait in 1978 to get an education. Hanaa owns many thobs, dashadish and abayas from Jordan, Palestine and Kuwait. down dresses to her daughters because just as she thinks of her mother and all of the good memories, she would like her daughters to think of her when they open their closets and see the cultural clothing in them. She describes the uniqueness of each dress through its stitching and from which the country it was sewn in. 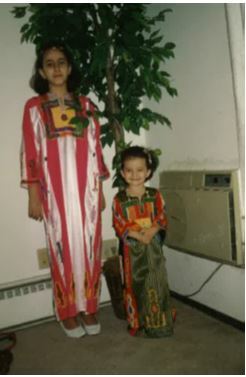 Her brother brings back dresses from Kuwait for her and she enjoys this very much because she grew up in Kuwait and the dresses keep her connected to memories of her home as a child. Throughout the years she has purchased dresses from trips to Amman, Jordan while buying her daughters some as well. Dresses become more modernized with the beading and cross stitching throughout the years but Hanaa likes to have both the traditional and modern dresses. 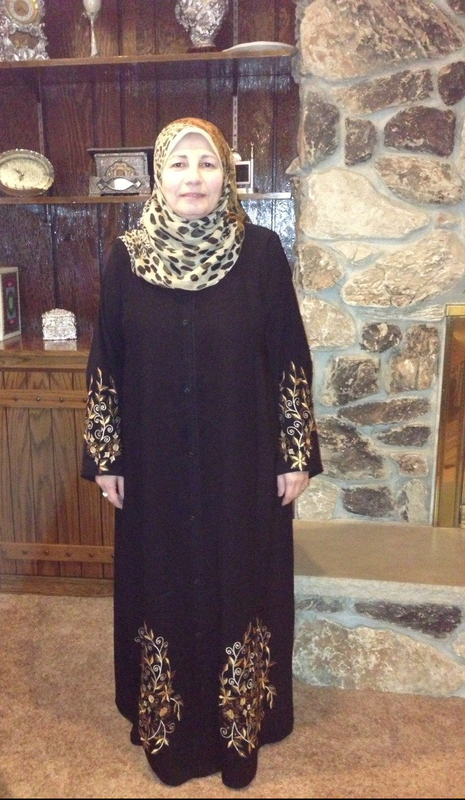 Fawziya is a 65 year old first generation immigrant who came to the United States in 1990 from Kuwait. Fawziya’s experience is unlike most of the other immigrants we interviewed in the sense that her staying in the United States was partly out of her hands. She details her immigration from Kuwait to the United States and shares that her original intention was only to visit her siblings in the Milwaukee area. 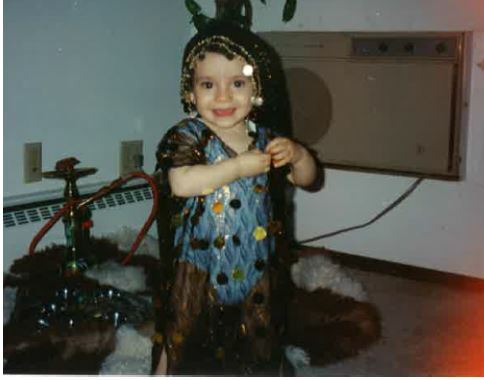 However, Sadam Hussein’s invasion of Kuwait in 1990 and Kuwait’s collapse while she was here in the US motivated her to stay in the Milwaukee area and greatly affected her ultimate decision to remain in the United States.Fawziya found that raising her family and bringing up her children in the United States was particularly successful for her. At times, tradition and culture clashed but she was able to withhold and foster a love of religion in her family. She has instilled in her children the importance of religion and she is proud to see her children starting their own families. Traditional clothing does not play a significant role in Fowziya’s life but she does wear the “hijab” along with modest clothing.